Gigi's Thimble: Sharing the Love! Well, thanks for all your sweet comments on my little Candy Hearts quilt from yesterday. It really was VERY easy to make and a lot of fun playing with the cheerful colors. I had bought 2 of those charm packs (for the hearts) from Lanie Jane's liquidation sale during the summer. The line is called Darla by Tanya Whelan for Free Spirit Fabrics. I absolutely loved the prints and colors, but wasn't sure exactly what I was going to do with them!?! Then last week I started feeling like my Happy Anniversary quilt that I have hanging in my entry right now was kind of blah. I needed something fun for Valentine's day to brighten up these long winter months that seem to be lingering on here in Utah. So since you all were so sweet about my design, I have a couple of things I want to give you! First, a little tutorial for everyone on how to make Candy Hearts and second, one charm pack to one of my followers. The charm pack is identical to the one I used to make Candy Hearts. Since I bought two charm packs from L.J. 's and only ended up using one of them for this quilt, I'm sharing the love! Just become a follower and leave me a comment below (telling me that you did so or that you already are) and I'll enter you in the drawing. Becoming a follower might not be such a bad idea because you're going to want to know when I start my really special giveaways in celebration of my new patterns! Prizes will include a Layer Cake from one very special Utah fabric designer, the original quilted wall hanging from one of my new patterns (I'll be sad to see this one go because I made it for my house :(), lots of patterns & possibly some more fabric! So you're definitely not going to want to miss out on these giveaways! Well, enough talk. Now onto that tutorial. 1. 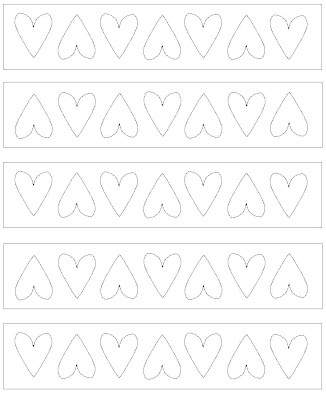 Create a heart template by cutting a 5" square piece of paper. 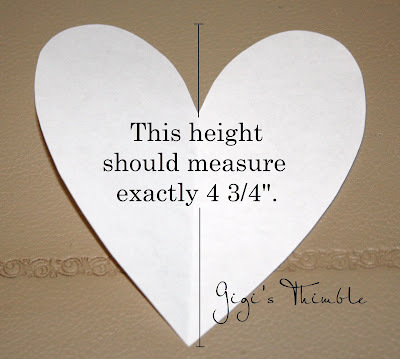 Fold it in half and cut out half a heart that measures exactly 4 3/4" from top to bottom. 2. Fold one charm square or 5" scrap of fabric in half, right sides together. Place the folded heart template on the fold of your fabric and trace with a pencil. With fabric still folded, cut out the half-heart on the traced line. Repeat with the remaining 34 squares of fabric to make a total of 35 hearts. Set hearts aside. 3. Cut out five 7 1/2" x width of fabric strips out of the light background fabric. Trim them down to 40 1/2". 4. To mark the placement of the hearts, fold each strip in half and iron on the fold to mark the center. Then fold the two ends into the center mark and iron on those two folds. Lastly, fold the two ends in again meeting at the last two fold marks, creating a total of 5 fold marks in the strip. The placement for the last two hearts is exactly 5" to the right of the second fold mark and the fourth fold mark. Use a clear ruler to measure 5" away from those fold lines and then line up the center of the two hearts there. Center the heart on the fold marks with the point of the heart 1 3/8" away from the edge of the fabric. Pin or glue baste into place. I used a few dots of Appli-glue on each half of the heart. 6. Sew 1/4" inside edge of hearts creating a raw edge that will fray when washed. Clip threads on front and back. Repeat for all 5 strips of hearts. 7. For sashing: cut six 2 1/2" x 40 1/2" strips of colored fabric. Using a pencil, mark a line down the middle of each one. Glue baste a piece of ric rac onto the marked line, leaving about an inch extra in case of fraying. Stitch down the middle of the ric rac using a thread color that blends. 8. Sew rows and sashing together, beginning and ending with sashing strips. Press seams towards sashing. 9. Cut five 2 1/2" x width of fabric background fabric for the borders. Sew end to end. Measure through the middle of the quilt from top to bottom. Cut two border strips that length and sew to the sides of your quilt. Press seams towards border. Then measure through the center of your quilt from side to side and cut two border strips that length. Sew those to the top and bottom of your quilt. Press seams towards the border. Candy Hearts is perfect for beginners! This is a quick project and would be great for Valentine's Day or even for that favorite little girl of yours! I'm thinking about putting a ruffle on mine instead of a regular binding. Wouldn't that be fun?!? First I've got to figure out the quilting on it though! If anyone out there makes it, send me a link, I'd love to see your finished product! Oh, and don't forget to become a follower and leave me a comment below. I'll pick a winner for the charm pack on Friday the 13th - at noon! You're already on my blog list! Very cute heart quilt! I've been a follower for a while! Very cute quilt! I am a follower already. I am definitely a follower. You are so talented and creative. Oh my gosh, look at you! That pattern is wonderful and gorgeous. You are so talented and creative. I won't be able to fit that quilt in before v-day, but I am going to put it on my list so I can have it for next year. You're number one in my Google Reader. Read you every morning. Keep up the great work. You're amazing, Amber! I feel like a celebrity just knowing you! Keep it up! So sweet, you have been in my Google Reader for quite a while now, #2 on the list! Thanks for the free tutorial! Love this tutorial, thanks! And I already am a follower. I just became a follower! Very cute heart quilt! I am already a follower. Thanks for the tute! oh is that ever precious! great job! Oh girl...thank you so much for visiting! I am soooo glad you found me because I have now FOUND YOU! I'm not a quilter but my mother is...a huge passion for her (I have it, too...but, can't do everything!). I love to see what other artisans create. Soooo inspiring! I'm going to follow along and tell my momma about you as well. love your blog, been following for a while now. Beautiful heart's pattern I love it and the ric rac is the best finishing touch!! 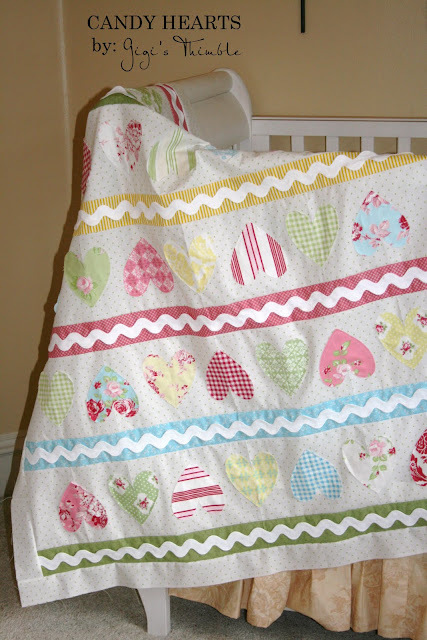 The heart quilt is so sweet and I can't wait to see more of your patterns! Just wanted to say I love valentines day and the quilt is just perfect for it! Hi I am now a follower! I love this pattern. I have a couple of charm packs that I have been stewing over for the last couple of days... This is just what I needed. Thank you! Wow Amber, this is such a sweet quilt! I love it. Great tutorial. I am a follower. Will be fun to keep up!! How did I miss this quilt? So adorable!